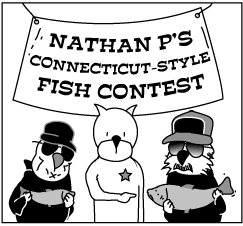 cryptonaut-in-exile: How To Be Happy Judging Connecticut-Style Fish? How To Be Happy Judging Connecticut-Style Fish? I'm from CT and I have no idea what this means. I'm going to get a Starbucks in me before I try to sort this out. Back. And there are some comments by Achewood regulars now to help me with the inside baseball stuff. Now, I'm from CT, but seafood averse, so I may just not be aware of a particular style; however, nutmeggers, as the panel suggests they might, do not eat raw, unprepared fish. Connecticut-style lobster rolls though are more plain than Maine-style, so perhaps that's the touchstone here? The other way I'm reading this is Connecticut is devoid of any sort of style or regional flavor. This may be true. We're a flinty, pilgrimish lot accustomed to the harsh reality of rocky soil and less than ideal climate for agriculture. Also, gynecomastia, also referenced in the panel is essentially Moob Disorder.